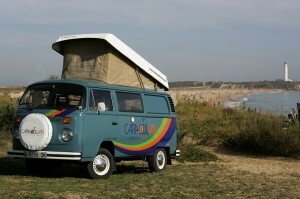 What is the Difference Between a Campervan and a Motorhome? 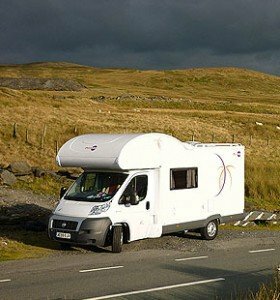 A guide to the different types of RV, motorhomes and campervans on the market. If you’re new to the camping scene, some of the terminology can be confusing. Not only do you have all the different classes to get used to: A-Class, RV, Overcab, Low Profile, etc, not to mention naming variations between countries (American Winnebagos and Australian Kombos, etc.) and slang terms (splittys, brickys, etc. ), there is also the enduring ambiguity between what constitutes a campervan and what should rightly be referred to as a motorhome. So what is the difference between a camper van and a motor home? The first thing to take on board is that there is a difference: although some camper vans may approach the specifications of a motorhome, the two terms are not synonyms and have evolved to satisfy the needs of a divergent demographic. The camper van is built to serve those who primarily want to explore – usually off the beaten track. In the UK, the word camper van is often used to refer to the much-loved VW Camper and the freedom-seeking lifestyle that goes alongside it. A campervan (or camper/caravanette) is primarily designed as a means of transport, usually ‘fitted out’ to provide basic accommodation. The typical camper van buyer wants to get up and back on the road quickly without too much fuss, and a typical camper van looks and feels very much like a vehicle – a van for sleeping in. Amenities are often basic, consisting of a refrigerator and cooking facilities, often limited to a couple of gas hobs and a simple grill. Many campers can also hook-up to an external power supply, either a campsite AC supply or a ‘deep cycle’ leisure battery. Campervans are often aimed at the affordable end of the market but, as with anything, as the price goes up so does the specification. Larger camper vans may include a TV, microwave, wastewater tank, canvas shade, bike rack and even a cassette toilet. As a rule though, you will not find shower or toilet facilities in a camper van. Nevertheless, the distinction between luxury camper van and motorhome can start to become blurred. Motorhomes were first built in the 1920s; their manufacture declined during the war years but started picking up again in the 1950s. A genuine motorhome (or motor-coach) is built to a different agenda and constructed in an entirely different way. Generally larger than a camper van, the emphasis for motorhome design is on comfort and creating a home away from home. If you purchase a motorhome you can expect each area to be compartmentalised, with a separate dining area and even a distinct bathroom. Some motorhomes will have a lounge area, either to the side or in a u-shape at the rear. Recent models may even include a shower cubicle. While relaxing in your motorhome you probably won’t even have a view of the cab, although the driver’s and passenger’s seat are sometimes able to swivel and become part of the living quarters. Motorhomes come in three basic categories: alcove, semi-integrated and integrated. Alcove motorhomes include a sleeping area above the cab, while the integrated are the most luxurious type. Integrated motorhomes are often identifiable by their large, expensive front windows. So next time someone asks you: ‘What is the difference between a campervan and a motorhome?’ you will know exactly what to tell them.